Trametes versicolor, also known as Coriolus versicolor and Polyporus versicolor, is a common polypore mushroom found throughout the world. Meaning 'of several colours', versicolor reliably describes this mushroom found in different colors. By example, due to its resembling multiple colors in the tail of wild turkey, T. versicolor is commonly called turkey tail. The top surface of the cap shows typical concentric zones of different colours. The flesh is 1–3 mm thick and has leathery texture. It commonly grows in tiled layers. The cap is rust-brown or darker brown, sometimes with blackish zones. Trametes versicolor contains polysaccharides under basic research, including the protein-bound PSP and B-1,3 and B-1,4 glucans. The lipid fraction contains the lanostane-type tetracyclic triterpenoid sterol ergosta-7,22,dien-3B-ol as well as fungisterol and B-sitosterol. Polysaccharide-peptide (PSP), a peptide in Turkey Tail Mushroom, has been tested in rats to assess its interactions with pain (hot-plate test for tactile heat pain, acetic acid writhing test for chemical pain) and PSP appeared to have weak pain sensitizing effects relative to control. The polysaccharide PSK appears to be a TLR2 agonist. 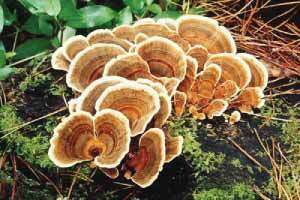 As a dietary supplement, take 1000mg of Turkey Tail Mushroom Extract once daily. To learn more, read the Turkey Tail mushroom reviews and experiences below. Where to Buy Turkey Tail Mushroom Extract? Nootropics Depot offers 30g or 60g jars of certified organic Turkey Tail Whole Fruiting Body Mushroom Extract. Nootropics Depot's Turkey Tail mushroom extract powder has been lab-tested and verified for both product purity and identity. You may also like Turkey Tail Mushroom Capsules.